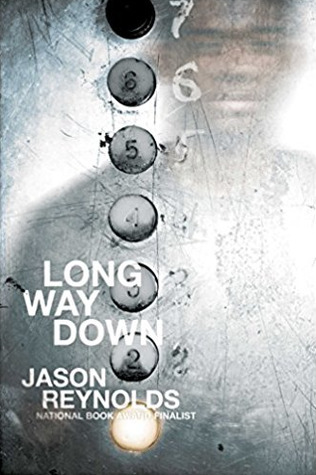 You had me at Jason Reynolds. Yes, I am a fangirl for Jason Reynolds (join the club, right?!). He is a master of voice and voice is the way to my reading heart. My first Jason Reynolds was When I Was the Greatest, which I listened to on audiobook. Audiobook is a great way to experience Jason Reynolds's work. It really feels like a character is sitting down and telling you their story. VOICE, MAN. Will knows the Rules. When someone you love is killed, you don't cry, you don't snitch, and you do get revenge. That's how it's always been, how his pop dealt with matters, how his uncle dealt with matters, how his brother dealt with matters. And it's how he's going to deal with matters. When Will's older brother Shawn is shot and killed, Will grabs his brother's gun and heads down the elevator, on a mission to complete Rule #3 and take care of the guy he knows shot his brother. But Will's not expecting the past to catch up with him. He's not expecting ghosts from his past to visit him in the elevator. In a modern, tragic twist on A Christmas Carol, Long Way Down explores how it feels to lose a loved one. And how it feels to lose your way, even when you've never been more certain about the path you're about to take. Written in verse, the text is short. Fitting, since the entire book takes place during a 60-second elevator ride. The verse is visceral, infused with emotion. It's expertly crafted to pack a huge punch into a small number of words. This is a book that makes it clear how easy it can be to fall into a cycle of violence, even if it's the last thing you ever thought you'd do. And (no spoilers) THAT ENDING, FOLKS. I need everyone to read this book so we can talk about that ending. I would hand this to teens who devour Ellen Hopkins or who like books about modern issues like The Hate U Give by Angie Thomas or Lockdown by Walter Dean Myers. Long Way Down by Jason Reynolds. Grades 7+ Atheneum, Oct. 2017. 320 pages. Review copy provided by my local library.